Learning a new craft is great fun, but finding a place to start can be overwhelming. Which designs do you begin with and where to get all those supplies? Luckily, Quarto has the answer with our new batch of all-in-one crafting kits. 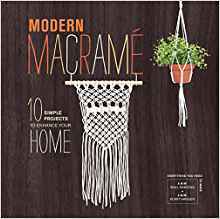 Whether you’re interested in macramé, felting, cross-stitch, or embroidery, these kits have everything you need to get started, including the supplies for two projects. These boxes are the perfect way to learn something new, or to give to loved ones who are interested in needlework but unsure where to start. Brooke decided to try her hand at the Felt Friends: Woodland Critters by Aimee Ray and the Modern Macramé by Justine Vasquez. I felt the embroidery craft kits were a little too advanced for her age, but these two kits were perfect for a second grader to hone their fine motor skills. The instructions were simple, and craft items were included, and she had a blast while I watched for any parental support she may have needed. Luckily, I was mostly just watching her make some incredible crafts. This is an excellent idea from Quarto and I look forward to their future All-in-One Craft Kits for kids!